Toyohara Kunichika (1835-1900) The Actor Ichikawa Danjuro IX as Kabuki Actor, c.1890. Oban Diptych. It is in prints like this that Kunichika’s current reputation lies. Kunichika was very highly regarded during his lifetime but the later portrait triptychs show extraordinary originality, design and innovation. Kunichika reinvented the actor portrait just at the time that the genre and indeed kabuki itself were on the wane in popularity. At the end of the nineteenth century woodblock prints were competing against the cheaper and brighter media of lithography and photography - those media themselves being signifiers of the public mood towards change and ‘civilisation’. Ukiyo-e was bound up with the past, with the shogunate and with conservatism. Kunichika counteracted this trend with half-length single figure actor portrait triptychs and diptychs, a completely novel compositional design. The daring bravura of these pictures, (given Kunichika’s reputation) is astonishing. Balancing a delicate economy of drawing and expression with the profligate use of the page this print is supremely indicative of his late and very great style. 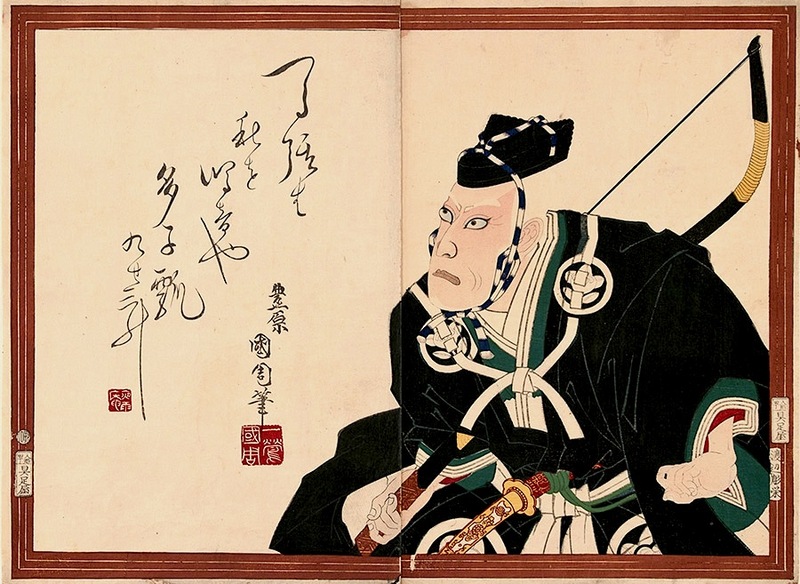 As in the previous triptych, Kunichika leaves the first panel almost empty, forcing the dynamic portrait of Danjuro into the right hand sheet. The composition is superb, the bowstring cutting the panel diagonally in half and the sparse coloured elements lighting up against the monochrome figure. The subject is likely to be Watanabe no Tsuna and here we see him poised for action, pressed into the corner of the print as if ready to spring. The border of the print is composed of concentric rice measures (mimasu) which is the Danjuro family crest. A fine print, two sheets unbacked, very good condition, full size with margins. Very fine colours and impression, embossed and burnished. Artist’s seal Toyohara Kunichika, signed Kunichika. Published by Gusokuya Kahei.